I'm still finding ways to use up the bussel of apples collected from our heirloom trees. Here's what's for dinner tonight served with artisan hard cider from Finn River Cidery. 1. Combine mustard and cider in a small bowl; stir well. 2. Heat a large nonstick skillet over medium heat. Spread each tortilla with about 1 1/2 teaspoons mustard mixture. Place 1 tortilla, mustard side up, in pan. Arrange one-third of cheese slices over half of tortilla; cook 1 minute or until cheese begins to melt. Arrange one-third of apple slices over cheese; top with 1 cup arugula. Sprinkle with 1/4 teaspoon pepper. Fold tortilla in half; press gently with a spatula. Cook 2 minutes on each side or until golden brown. Remove from pan. 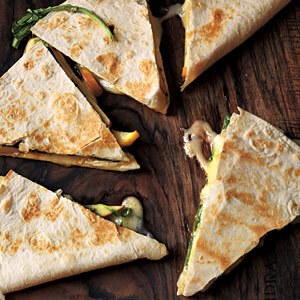 Repeat procedure twice with remaining 2 tortillas, cheese, apple slices, 2 cups arugula, and 1/2 teaspoon pepper. Cut each quesadilla into 4 wedges.